I am big fan of Korean BBQ, but am far from an expert on the subject, or as adventurous in my choices as such excellent cuisine warrants. Don’t get me wrong: I will go for some yuek hwe (steak tartare with a raw egg and pear), but that’s been the limits of my choices so far (past galbi and bulgogi). 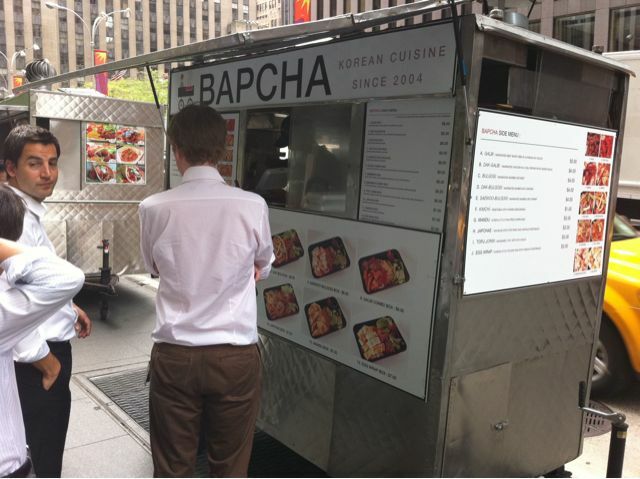 Nevertheless, after visiting Midtown Lunch, a food website I love, I noticed they had favorably reviewed the newly remodeled Bapcha Cart and decided to give it a go myself. Boy am I glad I did. There are, in fact, two branches of the Bapcha Cart. One handles soup, the other platters. 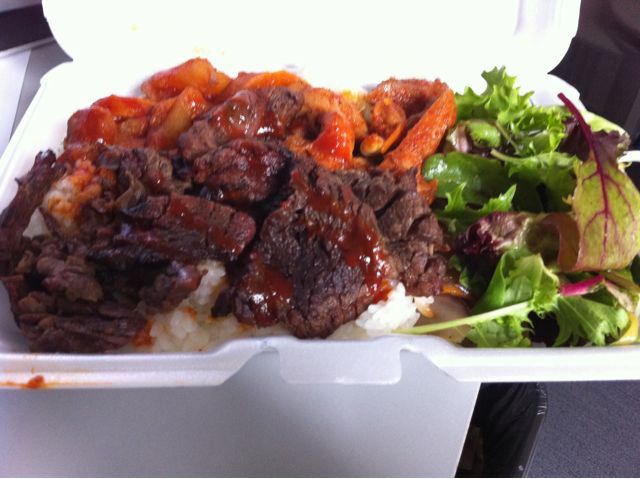 I opted for the platter this time, getting the Galbi Combo Box for $9.00. For meats, I chose the galbi (short ribs in a soy/barbecue sauce) and dak galbi (chicken in a spicy sauce). 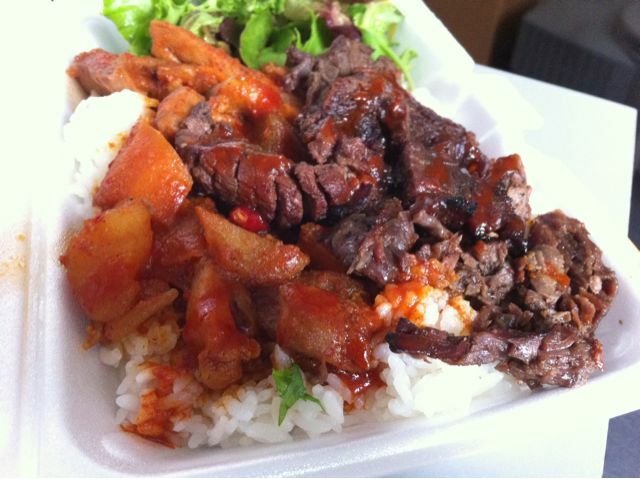 The galbi combo box from Bapcha Cart. 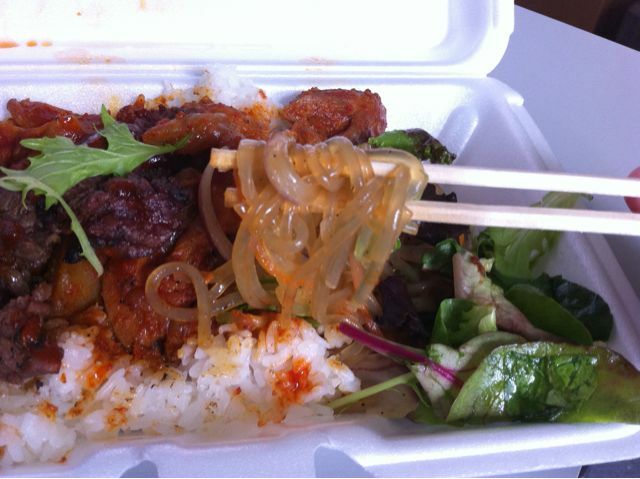 The galbi was smoky, rich, slightly sweet, just a bit chewy, and was slightly undermined by a hint of gas flavor. The dak galbi wound up being the star of the show. It was tender, chunky, surprisingly spicy, sweet, and had a faint hint of orange. There were chunks of potato(?) incorported into it. The concoction is covered in an orange sauce, making it hard to spot the spicy red chilis lurking in the dish. Another look at the dak galbi, left, and the galbi, right. The side salad, which was squirted with its own dressing, was slightly lost in the heat of the dak galbi. However, concealed beneath the green leaves, was a surprisingly awesome, wriggly gaggle of black bean soba noodles. They had an interesting, slippery texture and a faint sesame note. I found them delightful and kept coming back to them. The galbi and dak galbi sat on top of a generous portion of rice, which had a the right level of stickiness – good for grabbing chunks of it with chopsticks. Overall, it was very good and I would gladly return. It’s a heavier lunch than I’ve been having lately (owing to the diet). After eating, I found myself glistening with a faint sweat triggered by the spicy dak galbi, but cleaning out your pores is a good thing, right? Next time I’ll skip the galbi (can’t stand beef cooked over gas, it invariably gets that faint methane flavor). Very good overall, very solid portion for $9. 49th Street between 6th & 7th Avenue.